The award winning property management company of the North Country! 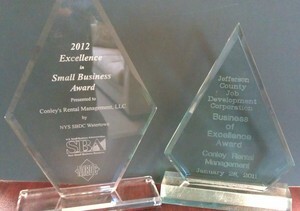 In 2011 Conley's Rental Management and Real Estate LLC received the Jefferson County Industrial Agency's Business of Excellence Award (right award) for 2010. In 2012 we received, from the NYS Small Business Administration, The Excellence in Small Business Award, Jefferson County district, for FY 2011! It's a pleasure to be recognized for all our hard work and excellent customer service! As an investment property owner, landlord and Real Estate Broker, I have personally purchased, managed and sold my own real estate and investment property for more than 15 years. Now, as the owner of Conley' s Rental Management and Real Estate LLC, I'm giving my vast personal experience and expertise...to you. I would like to thank our many homeowners and real estate investors who have allowed us to manage their property over the past 8 years! It's through their word-of-mouth that my company has grown 400% in just the past 5 years. No greater compliment can I receive, than a referral. For that I am truly grateful. The leadership team at Conley’s comprises of Chui S. Chan and Michael J. Siptrott. Chui is a former officer with the 10th Mountain Division and West Point Graduate. Mike is a former Master Sergeant at Ft. Drum and retired in 2006. This team understands the needs of the many soldiers here in the North Country and the challenges they face. We have the reputation of providing the best service possible to clients in the care of their property, as well as serving our tenants’ housing needs.